This was intended to be a two-round all-play-all between 5 players, but only 14 of the 20 games were actually played. Gaige gives what appears to be a partial result, before the event was finished, and dated 1876 (from the Baltische Schachblatter, vol.5, p.13), as does Sericano. Di Felice gives both the result from Gaige, with date '1877 (1876?)' and the complete result as if it were a separate event. The true situation is given in the Sept./Oct. and Nov./Dec. issues of Shakhmatniy Listok (sent to me by Geert Van der Wulp). The tournament was played between Oct. and Dec. 1877. 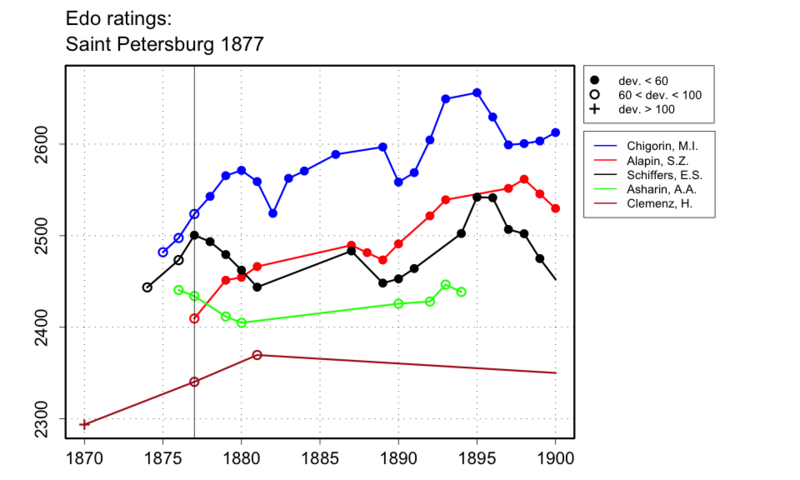 Some small tournaments were played in Saint Petersburg in 1876, but these were different events.